The third day in Falun, and preparations and rehearsals of the upcoming New Year concerts with Dalasinfoniettan, Nils Landgren and conductor Alexander Hanson. 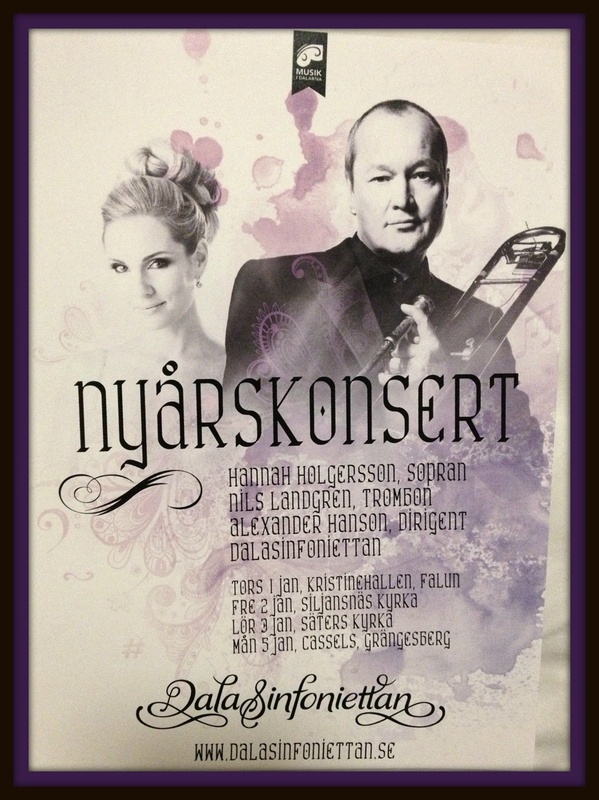 I will sing music by J Canteloube, D Milhaud, V Herbert among others, and a couple of duets with amazing Nils Landgren! We are all looking forward to the premier on Thursday here in Falun at Kristinehallen. 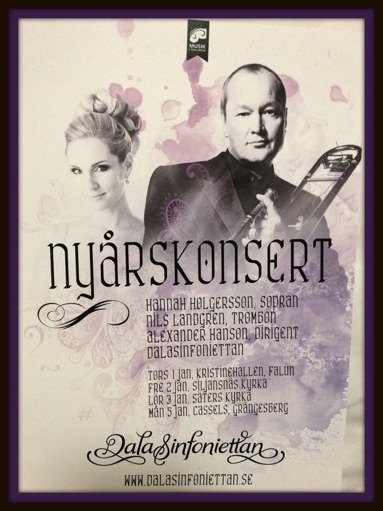 First day in Falun and of the New Year tour with Dalasinfoniettan, Nils Landgren and conductor Alexander Hanson! We met this afternoon for the first rehearsal and runthrough of the music. Looking forward to the coming days with these great musicians! 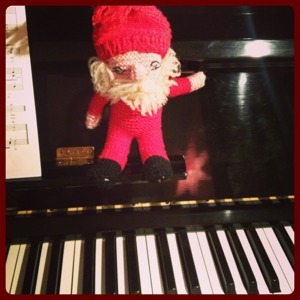 I wish you all a peaceful and joyful Noël! 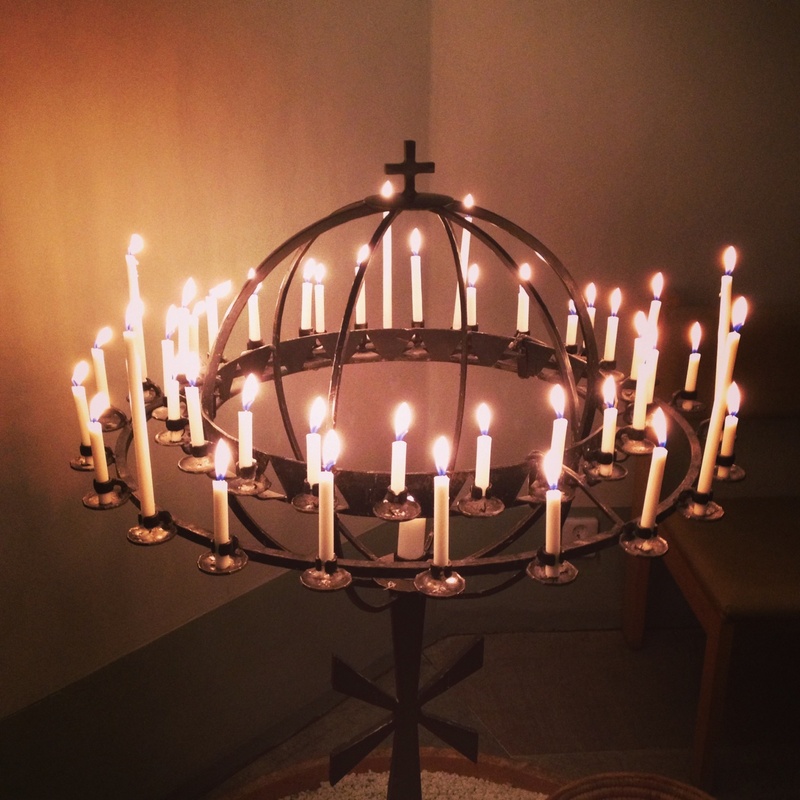 On Friday (Annandag jul) the 26th of December I will sing during the Memoriam concert in Ersta kyrka, 10 years after the tsunami of 2004. The concert will be broadcasted live on Swedish TV4. Bjørn Sagstad and Hannah Holgersson during intermission. I'm beginning to feel at home here in Karlskrona...! =) I have had the great pleasure and honor to sing will brilliant Marinens Musikkår (the Band of the Royal Swedish Navy) during three different productions since last year. My visit this time was for Christmas concerts at Karlskrona Konserthusteater, and tonight we did the final concert. Thanks from my heart to my friends and colleagues of Marinens Musikkår for great days, and of course big thanks to conductor Bjørn Sagstad for beautiful musical moments! Hannah Holgersson back stage at Karlskrona Konserthusteater. 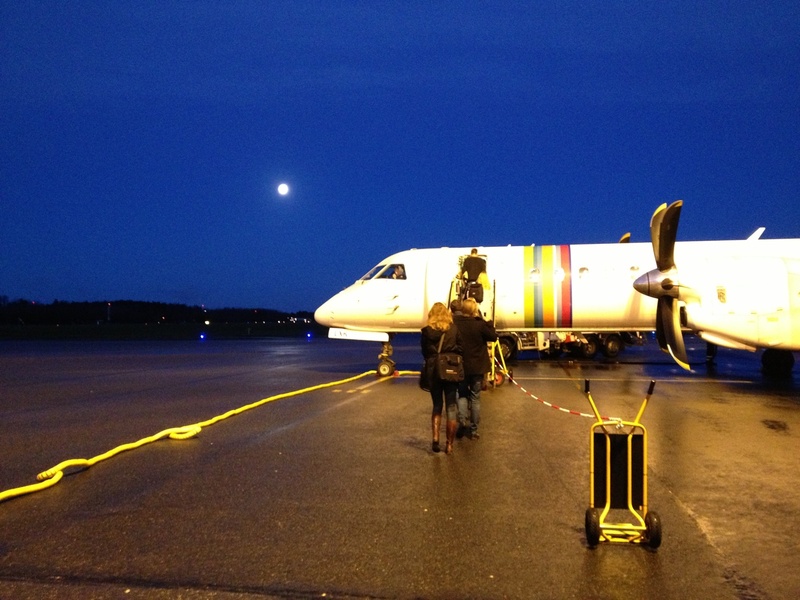 Yesterday I returned to Karlskrona after a couple of days in Stockholm. And today I woke up to a beautiful sunny December day, and couldn't wait to do the sold out Christmas concert this afternoon with Marinens Musikkår (the Band of the Royal Swedish Navy) and conductor Bjørn Sagstad at the Karlskrona Konserthusteater! 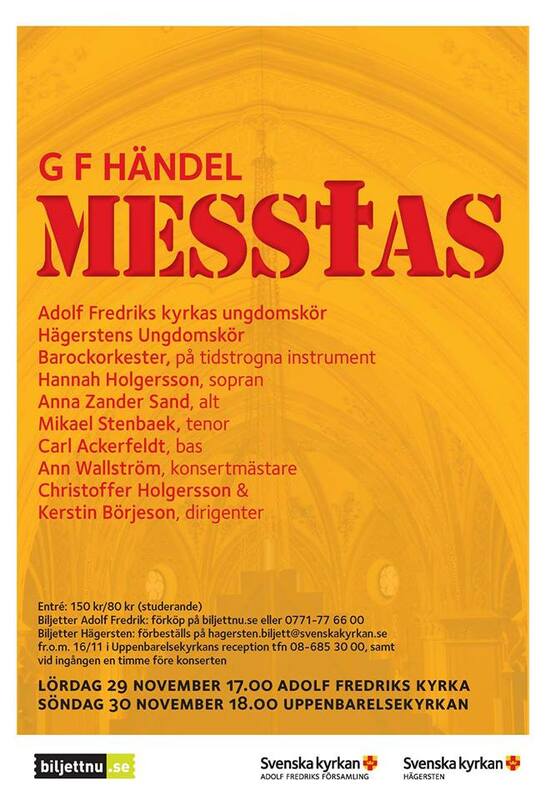 Looking forward to the final concert tomorrow night! Early flight from Stockholm/Bromma for rehearsal in Karlskrona today! Christmas is ahead and today I met my dear friends and colleagues of Marinens Musikkår, The Band of the Royal Swedish Navy! Together with the Norwegian conductor Bjørn Sagstad we went through the music for our Christmas concerts this coming weekend. Looking forward to these already sold out concerts! Another joyful production has ended! 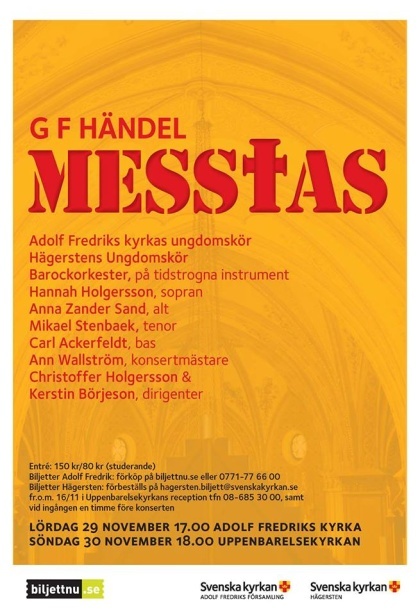 This time Messiah by G F Händel with wonderful co-musicans as Adolf Fredriks kyrkas ungdomskör & Hägerstens ungdomskör, Ann Wallström with baroque orchestra, Anna Zander Sand (alto), Mikael Stenbaek (tenor), Carl Ackerfeldt (bass) and Christoffer Holgersson & Kerstin Börjeson, conductors. Thank you all for moments of magic! Happy New Year 2015, my friends! The new year starts off with a sparkling tour together with Dalasinfoniettan, Nils Landgren and conductor Alexander Hanson! 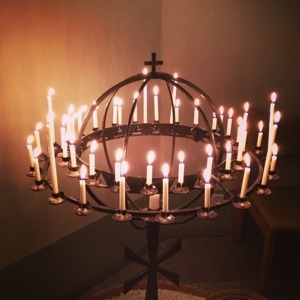 The tour begins in Falun and goes on to Siljansnäs, Säter and finally Grängesberg. Most welcome!